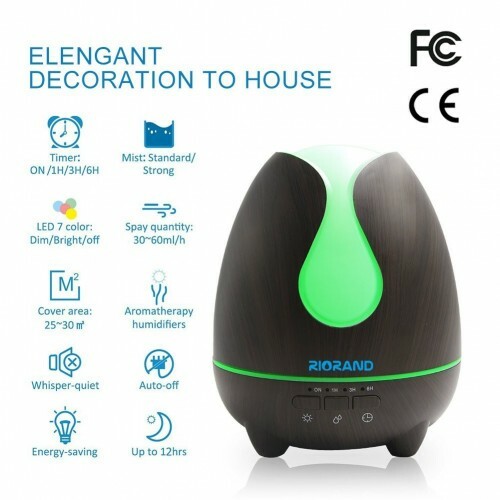 Color Name:BlackRIORAND Newest Water droplets Style Aromatherapy DiffuserThe natural aroma diffuser .. 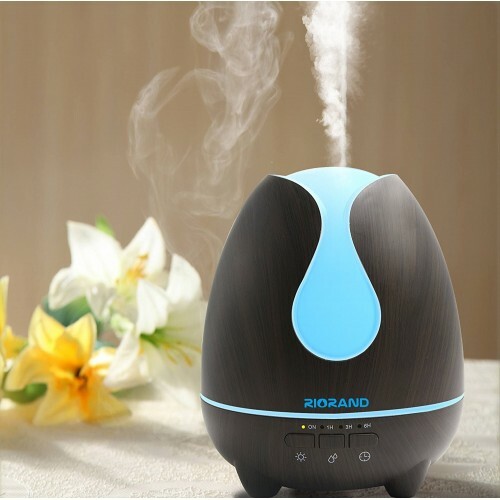 The natural aroma diffuser provides moist environment,create a calm and relaxing environment anywhere.Make your body and mood to cheerful. 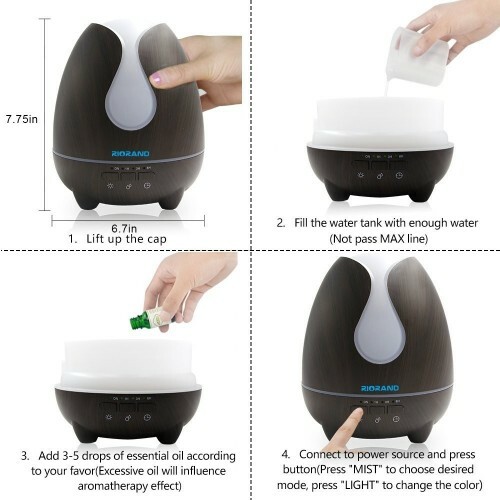 Water droplets Style and Black wood grain design makes the diffuser high-grade,look beautiful and perfect.This is also a very nice decorations,you can put it in home, office, bedroom, living room, study room and other places.And this aroma diffuser can hold up to 500ml-600ml of water. 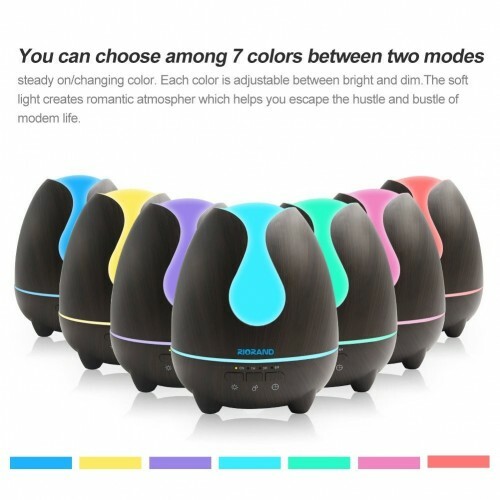 You can choose the 7 soothing LED light color,you can cycle through or freeze it on one fixed color.And the brightness is selectable from dim and brighter.Press the button,you will Experience the atmosphere of a calming and romantic atmosphere. You can choose the Mist strong or weak. One beep is for strong mist, two for weak mist. You can choose the mist time according to your requirements.5 timer is ON/1H/ 3H/ 6H/OFF. 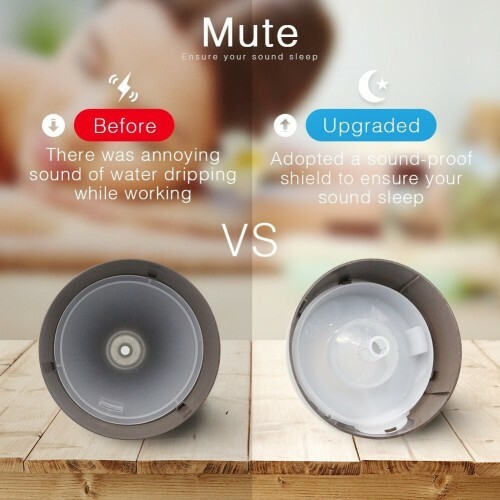 Auto Shut-Off function,as when it is detected that there is no more water or water runs out,the diffuser will automatically power off.Please Be Assured Use. 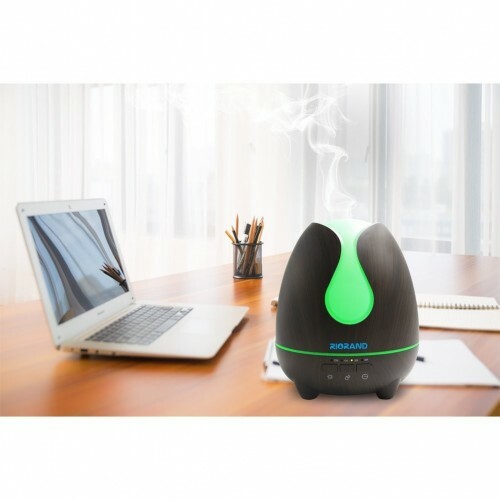 Adopted ultrasonic technology,super Quiet,this diffuser is extremely quiet when working and without annoying noise that won't disturb you when you sleep or at work. 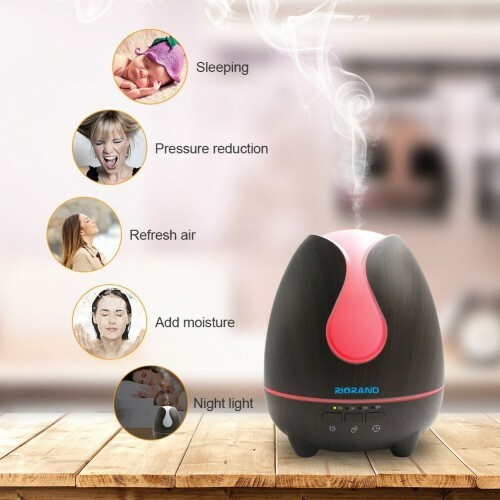 It's a perfect gift idea for family or friends.And It's a great choose for every room in your home, office, hotel--just about anywhere and fully enjoy yourself with this newset and exquisite Aromatherapy Diffuser in your leisure time. 4. Do not store the adapter in a damp place. 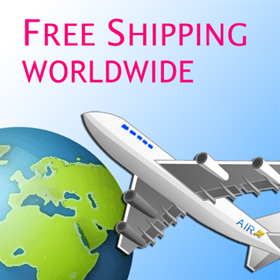 If you have any questions,please do not hesitated to contact us.